I thought it might be a good idea to repost this article as a reminder and check list for everybody. God Bless, Be Safe and Good Luck!!! When emergencies strike, there is often no warning. Therefore, it is crucial for every homeowner to have the necessary supplies in case an emergency arises. The first 72 hours that one's family is in crisis is the most important time for survival. Quite often, emergency vehicles and medical assistants have trouble getting through barriers, especially when natural disasters strike. Every family should have a least three days’ worth of survival supplies in an easily accessible area for when the time comes. Humans can survive on water for as long as two months. It is the most important element in being able to survive an emergency. A good rule of thumb is to have 3 to 5 gallons of water stored for drinking. Extra gallons may be purchased for cleansing, but the drinking water is most important. Always make sure to store your food in sealed packages to prevent bug and mice invasions. Ready to eat food pouches are a good way to go for making a survival kit. Foil sealed pouches do not require any opening mechanisms and they can stay fresh until the individual removes the seal to eat. The homeowner should purchase enough of these food pouches to last the entire family at least 72 hours. Larger packages are available to allow for extra time. First aid items are necessary for any injuries that may arise. It may take medics quite some time to be able to access the area, so it is best for the homeowner to put away as many first aid kits as possible. A basic first aid kit consists of bandages, antiseptic wash and towels, sponge dressings, alcohol pads, antibiotic ointment, and cotton balls and tips. Ace bandages and neck braces may provide additional protection just in case of more serious injuries. Electricity is lost in most emergencies. Candles, light sticks, and flashlights can provide an inexpensive source of temporary power for moving around. People with slightly better budgets can invest in an emergency power source such as an adventure kit. An adventure kit has the capability of charging cellular phones, appliances, and radios. Some adventure kits also have solar panels so they can receive power from the sun during the day. The homeowner should store plenty of blankets and sleeping bags so the family can stay warm and get as much rest as possible during this time of crisis. It would also be wise to store a very small kerosene heater for warmth when electricity is not available. Any hooded clothing should also go into the survival kit. An amateur band radio or CB radio would be very beneficial during this time. This will help the individual to communicate. CB radios will operate on batteries, so the user should be sure to load the devices with batteries before storing them.With these few items, a family should be able to survive the first 72 hours of an emergency. The rest of the survival process involves having faith and sticking with loved ones until the worst is over. For most individuals, the thought of being thrown into the middle of a natural disaster is terrifying. Unfortunately, the number of natural disasters that occur around the world is quite frightening. Depending on location, natural disasters can range from hurricanes, tsunamis, earthquakes, flooding, blizzards, and even human triggered disasters such as chemical spills. Naturally, the thought of having to be in the midst of such events can leave one with anxiety, fear, and questions of "what if." Fortunately, feelings of fear and anxiety can be decreased by a few simple steps that can help leave families better prepared for a variety of natural disasters. One of the most important parts of any survival kit is a plan. Although one may not be able to prepare for all types of disasters, having a firm plan on what to do if something goes wrong can help save lives. For example, if an area is prone to tornadoes, it can be imperative to have a "shelter" or safe place to go underground. No matter what type of natural disaster one's area is prone to, making a plan and practicing it can ease fear and anxiety. Know the area's warning signals and shelters: It's important to know what an area uses as a warning signal; most places uses sirens, but signals can vary. Keep in mind that one's family may be at different places during a natural disaster. It can be extremely important to know the warning signal so that all family members are aware of the disaster and ready to take action. Knowing the location and availability of shelters in one's area can help ensure that family members are safe and can provide a common meeting place. Devise a plan: Sit down with the household and talk about what would happen in the event on a natural disaster. During the discussion, it's important to talk about the type of natural disasters that could occur. Additionally, pick at least two meeting spots for the family. Next, have an evacuation plan. Once the plan is formed, the next step is to practice it: "The plan" needs to be like a fire drill for the household. Although fear and anxiety about natural disasters primarily center on death and loved ones dying, it can also be triggered by not having the right "tools." Thankfully, a variety of survival kits are available. Most individuals will have anxiety about food and water sources depleting in the wake of a natural disaster. A fear of dwindling food and water sources is a valid reason for having a storage area for emergency food and water ready beforehand because this could save lives and reduce this fear. Back up food and water should be kept in a place that would be easy to access in the case of a natural disaster. Do Not Forget your dog can be your family's very own Search and Rescue Dog!! Read these lessons and share them for others to read, so others may live! 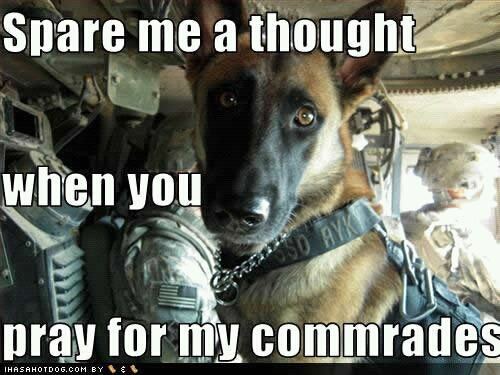 Support and Pray for Our Troops Worldwide!! 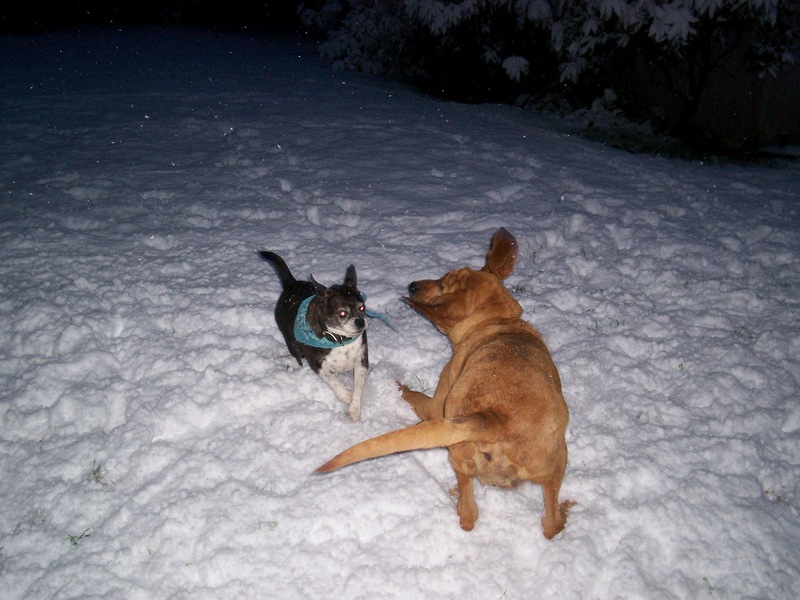 Gathering Scent Articles 4 Your Dog 2 Find You ! It's best to fully understand how a dog uses its nose. To a dog, A Scent is a Scent ! Therefore, the fastest and surest way to teach or ask a dog to find a person is to use the person's scent to show the dog who we want to find. This makes the job easier for the dog because no two people smell alike. To teach your dog to search for a lost or missing family member or friend, you have to prepare first by gathering the "scent article". This is easy to do but care must be taken. It is wise to keep these scent articles stored as directed below in case an actual search ever occurs. It's best to gather one dirty sock from each person you can think of who you might ever have to look for before you start training your family pet. Each sock should be handled and stored as outlined below for later emergency use. In case you ever have to call officials in with search dogs tell them you have a scent article which will save valuable time. Place one dirty sock from each family member in a freezer bag after reading below. DO NOT touch the sock yourself, have the person drop the sock from their foot to a new brown paper bag (lunch bag size) or into a new plastic freezer bag. You will learn more about scent article use during lessons. Do Not Contaminate that sock. Do Not Put 2 socks from different people together, each sock gets its own bags. Store socks in the freezer until a few minutes before use. This is the so-called "Scent Article"
The “Scent Article” tells your dog who they are looking for. Keep one for each family member for use if a disaster ever strikes. When gathering "Scent Articles" of missing people during an incident, you will follow the same rule of Do Not Contaminate the article or location.A scent article can be any item or object the missing person is known to of touched recently, such as a piece of clothing, bath items, pillow case, smoking items include butts of cigars or cigarette, hankie, tissue paper, a cup or glass or steering wheel in the car and the seat or bed the person was last in. Preservation and Collection of the item is critical to avoid another person's scent from getting on the item and contaminating it. the dog will disregard its handlers scent but it is still wise for the handler to take special care when handling the scent article. Always try to pick up and deposit the scent article into a clean bag by using a stick laying nearby or coat hanger from the subjects home to keep the item clean of other scents. Ask the family who touched what and do not use any item others have touched if possible. If the missing person and others have touched everything then ask the people to stand by when you start the dog to look for the missing person. For instance, if a person is missing from a parked car where other people had been in the car with them, ask these people to stand by and take your dog to the car where the lost person sat and ask your dog to smell the seat then find the person. Your dog will use a missing member search technique of eliminating the people who are on the scent article (the car) and go to the people who are standing by then set off looking for the missing person. But if the people are not there for your dog to eliminate them then your dog will look for all the people in the car. This is why it is important to find out before you start your dog who touched what that the missing person touched and where was the person last standing,laying or sitting. 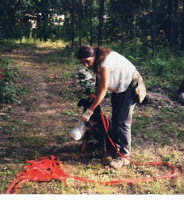 Who was with them and how long have they been missing are also critical to a successful search because of possible contamination of the scent article. A contaminated scent article will lead you on a wild goose chase, take care. Only you, your dog and the person who is missing should come in contact with the item or location used as the scent article or starting point. Amber and Bloodhound pup Bo getting ready to train how to Trail a Lost Person. Bo was 5 months old at the time of this picture in 2001. 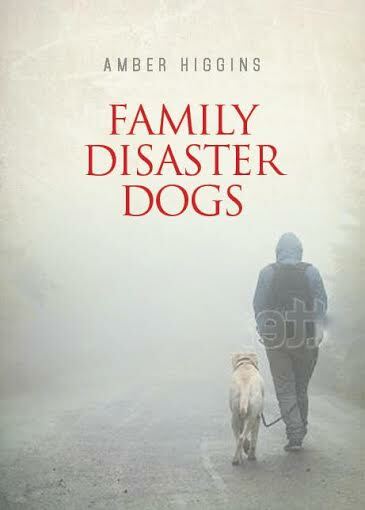 Go there to Get The Family Disaster Dogs Book for all the lessons and lists of needed items so you can be prepared ! Coming soon "My Puppy Can Find Me" picture book will teach your children, you and dog how to work together if they are ever separated from you !